We have a fantastic interview with the man who has inspired so many people to explore the world on motorcycles, Ted Simon, author of Jupiter’s Travels. It’s just over 40 years since Ted set out on his life-changing ride, and even now he still loves getting out on the bike. He discusses the impact of the book, his life since then and his latest book, Jupiter’s Travels In Camera. 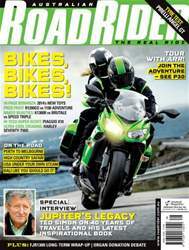 This issue we settle the great debate: BMW R1200GS or KTM 1190 Adventure? Check out the comparison! And we also have the hottest trio of nakedbikes: BMW’s K1300R, MV Agusta’s 1090RR Brutale and Triumph’s Speed Triple R. For something a bit more laid back, we go cruising on the Harley Seventy-Two and look at Piaggio’s hi-tech X10 maxi-scooter. Also in the latest edition of Australian Road Rider, we’ve got great stories on crossing Australia, the GS Safari, touring the US on your own bike and how to enjoy Bali on two wheels.